UKTV has announced production on False Witness, a two-part thriller set in Sydney, Tajikistan and London. Written by screenwriter Peter Gawler (Underbelly), the series will explore “the murky world of international intelligence with an explosive and unstoppable chain reaction of events.” It is directed and co-produced by Peter Andrikidis and Greg Haddrick is also co-producer. The plot is inspired by real incidents including the 1997 theft of five Soviet built nuclear “suitcase bombs”, and explores the build up to a possible nuclear attack. 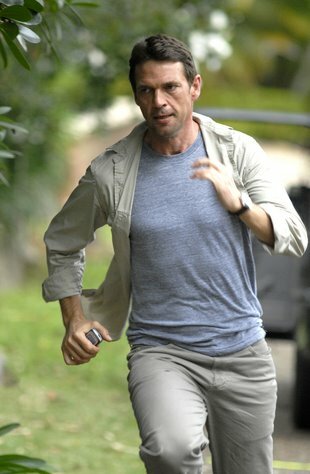 It will feature Dougray Scott, Rachael Blake, Jeremy Lindsay Taylor, Claire Forlani, Don Hany and Richard Roxburgh. UKTV has commissioned the series as part of its require drama output. It has previously made Make or Break and Supernova. To air in early 2009, False Witness will be produced by Screentime and Power Productions. UKTV is thrilled to confirm production is under way on False Witness, a Screentime and Power production. Acclaimed award-winning Screentime team Des Monaghan (Executive Producer) and Greg Haddrick (Producer), are at the helm of this international mini-series. False Witness is directed and co-produced by AFI and Logie award-winner, Peter Andrikidis and scripted by multiple AWGIE-winning screenwriter Peter Gawler from a story by Ronan Glennane, Nell Greenwood and Greg Haddrick. A stellar British and Australian cast including Dougray Scott, Rachael Blake, Jeremy Lindsay Taylor, Claire Forlani and Richard Roxburgh will bring the explosive thriller to life. “Partnering with Screentime is extremely exciting. They are an amazing team with a brilliant track record of producing distinctive, quality drama including the critically acclaimed series Underbelly,” continued Dahill. British diplomat Ian Porter (Dougray Scott) is apprehended at Heathrow airport in possession of 20 kilos of heroin. Porter’s unwillingness to co-operate leaves Scotland Yard Inspector Julie Hales (Rachael Blake) believing he is doing business with Russian arms and drugs trafficker Sergei Krousov (Don Hany). Hales accompanies Porter and his wife (Claire Forlani) to Sydney, where chameleon Porter believes his handler at MI6 (Richard Roxburgh as Van Koors) can manipulate the Australian Federal Police protection team to allow him to complete his mission. AFP agent Wilson (Jeremy Lindsay Taylor) and Hales have no idea of Porter’s MI6 links, so when their security is stunningly breached all hell breaks loose. False Witness will premiere on UKTV in early 2009. Does anyone know who covers the Russell Morris song ‘The Real Thing’ in the ad for False Witness?